Learn: What is Visual Studio .Net, why it is used? What are the features and how it is beneficial for the development environment? VISUAL STUDIO.NET is an IDE (Integrated development Environment). This is basically designed to make software development easy. Visual Studio.NET comes with .NET framework, which provides an environment for creating console, windows, and web based applications. It supports all .NET compliant languages. It is very popular IDE for .NET. It provides Intelligence that means developer does not require remembering methods and member of class. They can get all information like methods, properties etc regarding any class or object by typing dot (.) after the class, object or related thing. 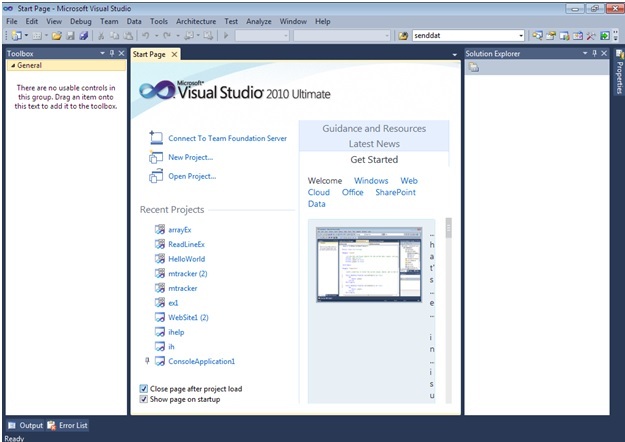 This is an image of Visual Studio .Net 2010, According to .NET framework, Microsoft always release new version of visual studio. Visual studio 2010 supports up to .NET 4.0 framework and other latest versions of visual studio supports new version of .NET Framework. It is used to write and fix your code fast. We can easily debug and profile code. We can develop windows and mobile app and web services using Visual studio.NET. It provides agile based version control. We can easily build, manage, and deploy cloud scale apps to azure. It utilizes powerful tools for office software development. It supports good graphics for game development. Develop and deploy SQL Server database easily.